It goes without saying that when it comes to Indian restaurants, your spoilt for choice in Adelaide. A quick Google search will show 12 restaurants in the CBD alone. So, in such a crowded market, how do you stand out? How do you put your stamp on the map? Javitri is a brand new Indian Restaurant located in Hyde Park that I can attest has absolutely placed a big stamp on the Adelaide food scene. With head chef, Prashant Penkar, at the helm with 12 years’ experience from around the world. Modern Indian Cuisine has been given new life in the most exquisite of ways. Prashant invited Adelaide Food Central to Javitri to take us on a whirlwind tour of an exciting and fascinating journey into Indian cuisine. This adventure started with an Asparagus and Almond Fritter. The starter set the tone for Javitri’s food philosophy. A sensation delight that is smooth and creamy with a crunch. As with many dishes at Javitri, it uses ingredients not commonly used in Indian dishes however you can always recognise the Indian influence just below the surface. This was complemented with a Kokum and Cumin Sharbat to provide a sweet contrasting flavour to the fritter. Javitri dishes are inventive and alluring with its heart always close to home. A good example of this is the Green Pea, Spinach and Granola Tikki. Tikki is typically made with a potato base but Prashant introduces a twist to formula introducing granola to the equation, creating a crispy and textured dish. This is complemented with cranberry and ginger chutney, a pipette of tamarind placed inside, all on top of a slice of Tandoori cottage cheese. This comes together to bring about a sharp memory of Indian cuisine but unlike you remember it. Moving on to more main dishes, we were presented with a Fennel Smoked Tandoori Salmon. 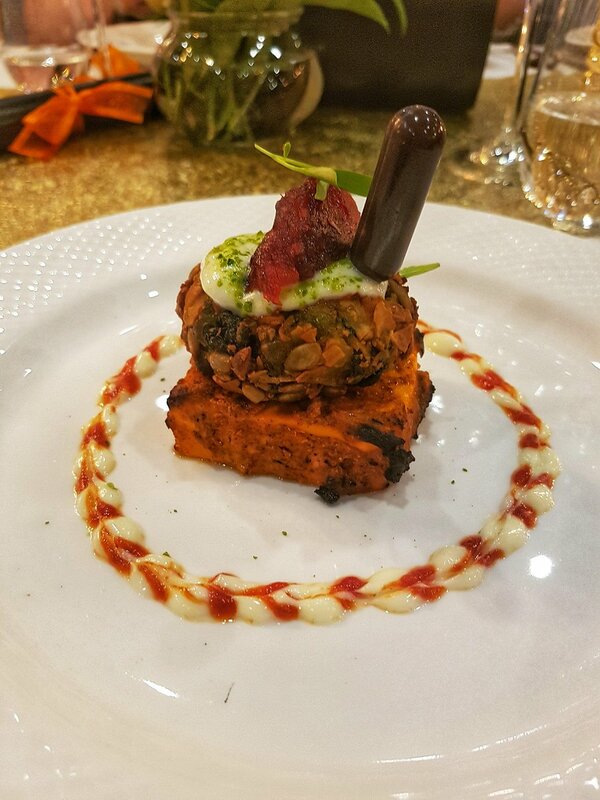 This dish highlights more of Javitri’s philosophy, that dining should be a worthwhile venture with warm memories. 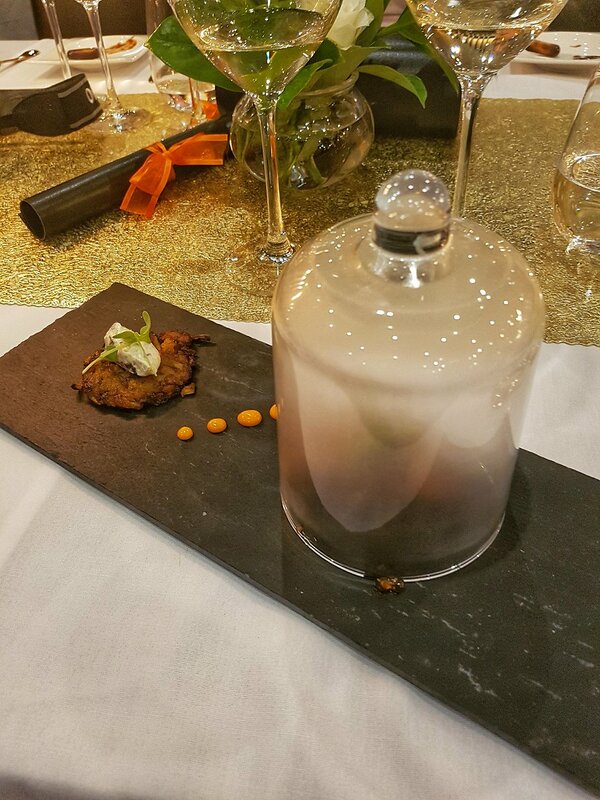 The dish is brought out with a glass cover placed over the salmon. Allowing extra smoke/steaming to occur while it’s on your plate. Leaving the cover to fill with smoke for a while before lifting it and revealing your meal in a plume of vapor. It’s a small moment but adds to your night out. It’s these small details that Javitri is all about. The salmon is served in a fennel mustard marinade, smoked honey alongside a turmeric potato rostie, shallot raisin yoghurt and smoked salmon roe. A simple lemon sorbet is served to cleanse the palette before my personal favourite was served. Prashant Penkar has had a storied career, working with some of the best chefs in the world in Michelin star restaurants. With his experience he has looked towards combining his passion for Indian cuisine with what he has picked up travelling the world. This is no more evident than in the Cottage cheese and Green Pea Lasagne. Served with Masala couscous, tomato makhni, mint coulis, black sesame seeds and carrot-ginger relish. As Prashant describes, this is not a fusion. This modern Indian cuisine. A new inventive dish that calls back to its Indian roots in its ingredients and flavours, but all together creates a unique experience. This was followed up by the piece de resistance. A Lamb Shank Korma, this was served with spinach, raisin masala freekeh, lamb fritter, coconut snow, truffle ghee, and sweet potato crisp. Three sides were also offered alongside this dish. These included an edamame and golden cashew pulao, truffle ghee naan and Masala goat cheese and green pea kulcha. The crew at Javitri have a focus on perfection and innovation. This is seen in this dish, where the meat falls from the bone but still has a fine texture so the flavours can be enjoyed for a time. The sides combined express the wealth of experience on hand in the Javitri kitchen. Offering an incredibly original ghee nann alongside it’s Punjabi relative of goat cheese and green pea kulcha. This shows not only their knowledge with Indian cuisine but their willingness to experiment. All of this was topped off with a Dessert Platter which had everyone excited. A sample of 4 of the delectable desserts which Javitri offer. Again, highlighting a philosophy of applying modern twists to traditional dishes. 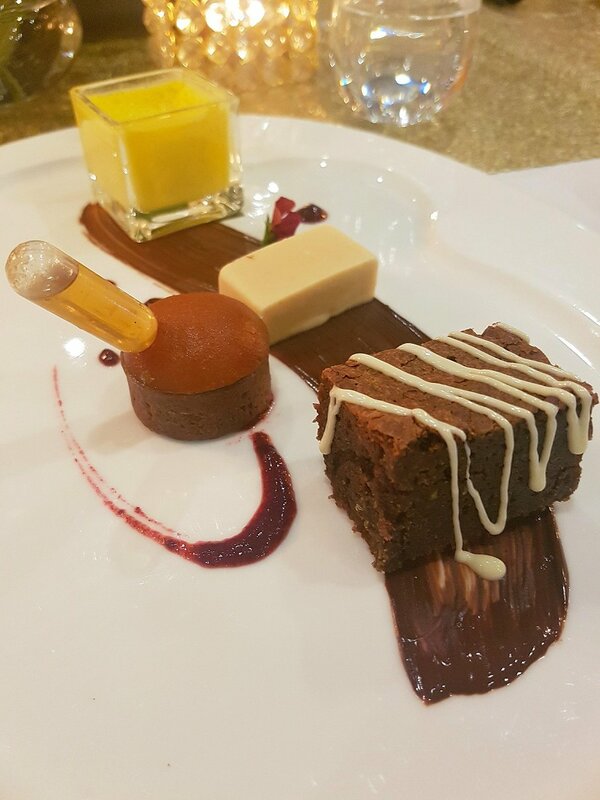 Included in this was a baked saffron lassi, taking an Indian yoghurt drink which has been popular in Australia and turning it into a baked desert. An accompanying rosemary and white chocolate kulfi has an astounding and striking flavour, standing out on the plate. Also served is an Orange and Fennel Brownie and a Gulab Jamun tart. Altogether this creates an experience for the senses. Paired with an extensive selection of local wines and with a setting that is quiet and comforting, Javitri puts the right foot forward to shine a new light on modern Indian cuisine. Javitri is a must for fans of Indian food as well as those who are not, because Javitri is like nothing you’ve had before. Javitri is located in Goodwood, and is open for lunch, Thursday to Sunday from 11:30am-2:30pm, and for dinner, Tuesday to Sunday from 5pm-9:30pm. Previous Post Akoma & Co.